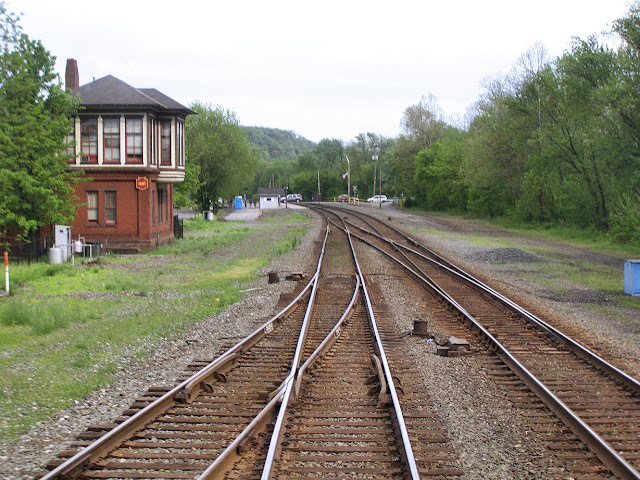 Well I just got back from a trip surveying the old PRR Main Line between Huntington and Lewistown and I have a few updates to share regarding the extent of the re-signaling project and other related news. First, to summarize, new NS Darth Vader signals and Rule 562 operation is going in on the PRR Main Line between CP-BANKS and CP-ANTIS. Nothing about that has changed, although I did notice the following details. First, at CP-HUNT, new signals are up, but the PTC antenna is not, so there is still a bit of work to do. The pneumatic point machines are still in place with no sign of replacement, so that's good. The adjacent HUNT tower is now signed as the home for the local Chamber of Commerce with no mention of the museum that should be located there, so that was a bit worrying. 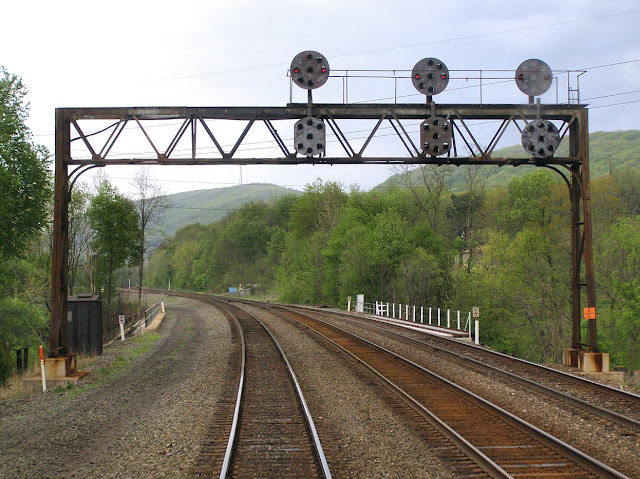 In terms of modifications, the new eastbound cantilever at CP-HUNT has been placed several hundred feet east of the existing PRR PL masts where they are visible around the curve. I suspect that thanks to cab signals and PTC, NS is less worried about signal sight lines than Conrail had been. The MP 200 automatics, seen above in 2009, had a fresh coat of paint, just in time for them to be removed for the Rule 562 operation. The westbound dwarf at CP-JACKS is getting replaced by a cantilever mounted, slow speed, high signal, but adjacent to the signal bridge was an old school signal power transformer mounted on a short pole, complete with PCB stickers and everything! An interesting feature that I first saw at CP-HAWSTONE also turned up at CP-McVEY and CP-LONG. This is the use of the old pneumatic air line to deliver gas to the direct burner point heaters. It does not appear that this system is being retired. Also, the old air-line at CP-JACKS was still in place, even though those air switches were removed over a decade ago. 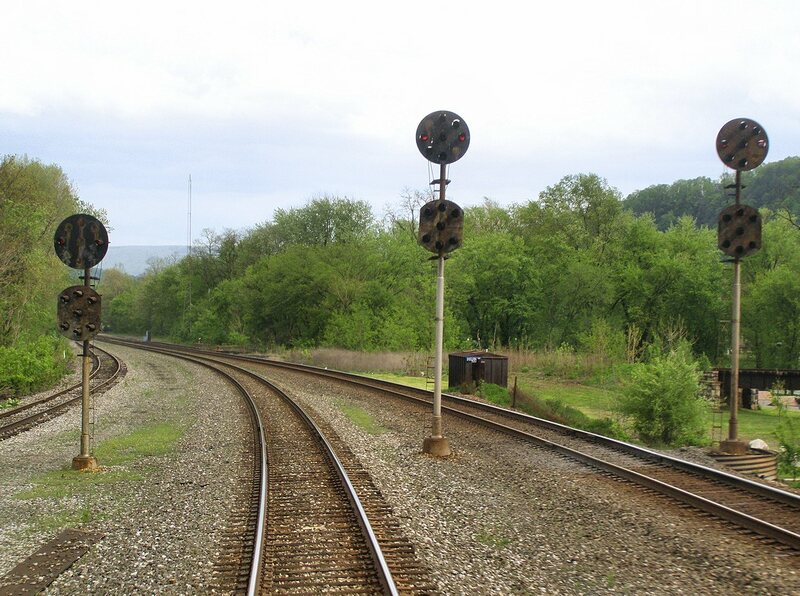 I can also confirm that new signal equipment appears to be going in all the way up to CP-ANTIS so anyone who wants pics at CP-TUNNEL, CP-GRAY and the famous Fostoria signals, better go get your photos soon. 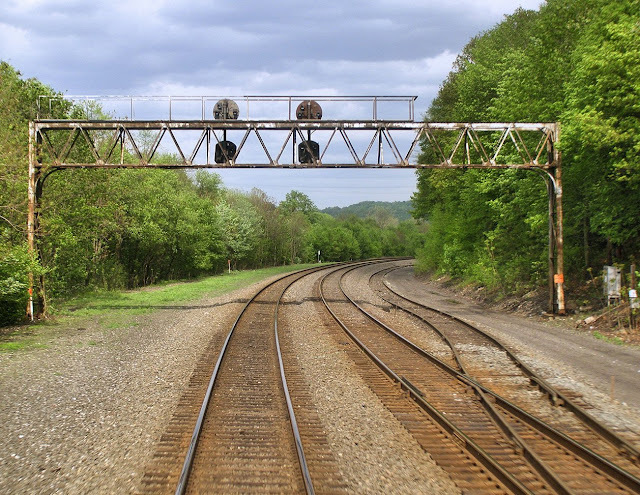 Finally, on a different PRR Main Line, the one between Philadelphia and Washington, Rule 562 'C' boards have appeard at interlockings between PRINCE and REGAN, inclusive. 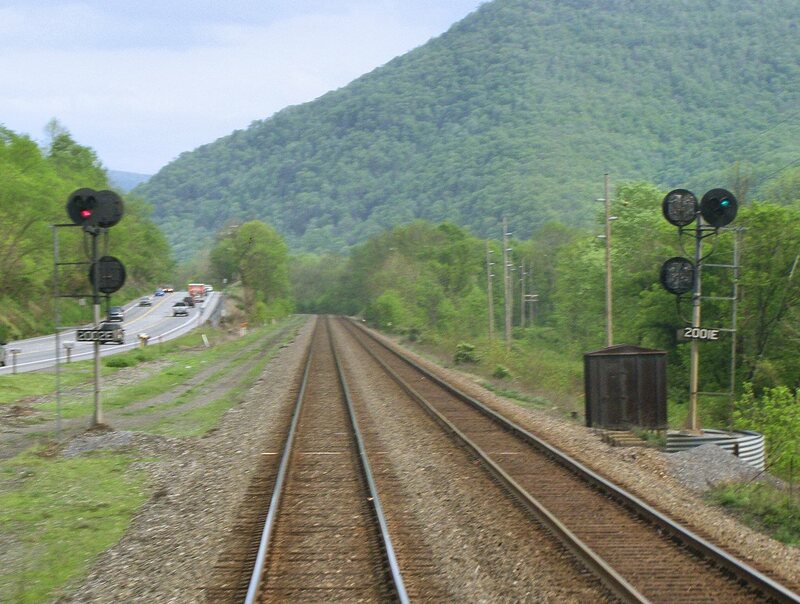 It looks like Amtrak will be re-signaling the "commuter free" zone, possibly for higher Acela Express speeds.